Ashley R. Henley (born 1981) is an educator in Southhaven, Mississippi who is a Republican state representative for District 40 in DeSoto County in the northwestern portion of her state. From 1996 to 2008, Henley was a motion picture projectionist. In 2000, she obtained an associate of arts degree in secondary education from Northwest Mississippi Community College in Senatobia in Tate County, at which she has been since 2010 an adjunct history instructor. She then procured bachelor's and master's degrees from the University of Mississippi at Oxford in 2002 and 2006, respectively. Since 2002, she has been employed by the DeSoto County School District. In 2004, she won the state competition for the James Madison Memorial Fellowship, which allowed her to study the Constitution of the United States and its importance in education through a special course at Georgetown University in Washington, D.C. In 2015, Henley won the Republican nomination for the District 40 House position by unseating the incumbent Pat Nelson, 799 votes (56.6 percent) to 613 (43.4 percent). She then defeated opponent Hester Jackson McCray, 1,173 (68.3 percent) to 544 (31.7 percent), in the November 3 general election. Henley serves on these House committees: (1) Military Affairs (vice chairman), (2) Apportionment and Elections, (3) Constitution, (4) Corrections, (5) Education, (6) Technology, and (7) Tourism. 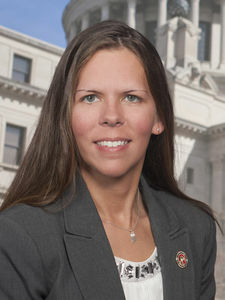 In 2016, Representative Henley co-sponsored the bills to prohibit dismemberment abortions in Mississippi and to expand exemptions for compulsory school vaccinations. She voted to grant civil and criminal immunity to those reporting what they believe are instances of terrorism. She backed legislation to permit churches to have designated personnel with firearms. She voted to guarantee protections for religious beliefs and matters of moral conscience. In 2017, she backed the measures to authorize additional methods of execution in Mississippi and to classify the killing of first responders as first-degree murder. ↑ 1.0 1.1 1.2 Ashley Henley. Billstatus.ls.state.ms.us. Retrieved on October 11, 2017. ↑ Ashley Henley's Biography. Project Vote Smart. Retrieved on October 11, 2017. ↑ Republican Primary election returns. Mississippi Secretary of State (August 4, 2015). Retrieved on October 11, 2017. ↑ General election returns. Mississippi Secretary of State (November 3, 2015). Retrieved on October 11, 2017. ↑ Ashley Henley's Voting Record. Project Vote Smart. Retrieved on October 11, 2017.